Patterson, J. (2005). 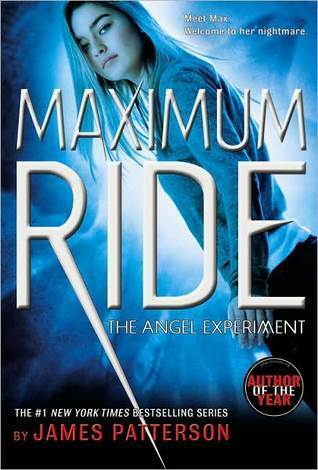 The angel experiment (Maximum Ride #1). New York: Little, Brown & Co. Personal reaction to the book: It’s a crap book, but it’s a crap book aimed carefully at a demographic that undoubtedly loves it. The extensive, repeated descriptions of flying and escaping the bad guys / grownups are interminable for a middle-aged man; I’m sure they resonate for 12-15 year old kids who wish they had more freedom. They seem odd coming from a man known for action titles, with their relentless momentum. A less-charitable reader might feel they are padding to ensure the series runs sufficient titles despite not much happening. I am usually that reader, but honestly it’s hard to argue with this much success. The gimmicks around the book (the “hand-written” notes from Max to read this book / the next book; the preview chapters; the ads for tie-ins) probably seem cool to the target audience. I am one-and-done with anything YA from Patterson (and probably Patterson in general), but if you want to know what works for young teen / tweens, you should read this. Author facts: In 2011, it was estimated that one-in-four of all hardcover suspense/thriller novels sold was written by James Patterson, and that’s not counting his kids’ and young adult titles. He has become a champion of childhood literacy through his readkiddoread.com website among other ventures. He has started crediting co-authors on his books. Next Post Death or glory, just another story?